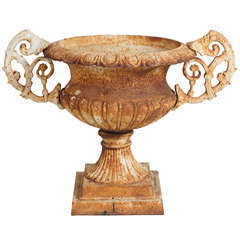 Stone garden urn by George Washington Maher, America, circa 1900 Beautiful stone urns designed by American architect George W. Maher. 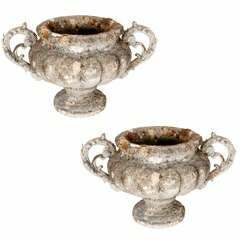 Interesting pair of French 19th century cast stone garden urns from Aix-En-Provence. 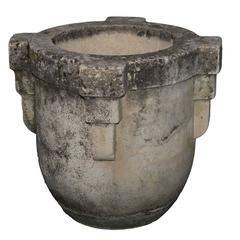 Fabulous Art Deco stone garden urns with simple, yet elegant design. Immense in size, with unique, naturally aged patina. 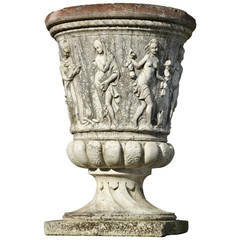 Large Continental reconstituted stone garden urn of circular section and tapering form, the knopped rim above a frieze of dancing maidens, with waisted socle and square section base. 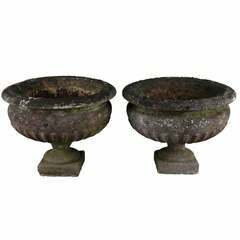 Matching pair of antique Victorian garden urns. Hand crafted in stone. Mid 19th century. More available. Each robust cup-shaped urn with rolled lip resting on a square base; stamped.